I came across this article while researching another man, published in the Birmingham Daily Gazette, November 19th, 1915. What caught my eye was the five words "nineteen clasps for South Africa" - who were the Stebbings? Papers exist for Benjamin and William which confirm the family connection. No papers exist for Edwin. These boys provide the tally of medals and clasps (20 actually), except the Long Service & Good Conduct which could belong to the father or Edwin, no papers exist for either. All three boys served together in the 2nd battalion Devonshire Rgt in the Relief of Ladysmith campaign earning the clasps: Orange Free State, Transvaal, Tugela Heights, Relief of Ladysmith and Laing's Nek. Benjamin was invalided in 1901 earning the "South Africa 1901" clasp - perhaps this clasp was not counted by the newspaper. 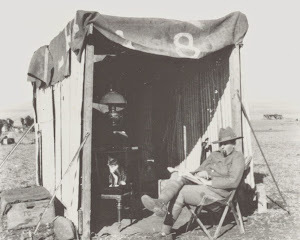 Edwin was awarded the DCM for the action on Tugela Heights February 23rd, 1900.